The women of today is a multi-tasker, on the go, powerhouse! We wanted to give her a hand in keeping up her fierce look by providing a better way of organizing all her cosmetic essentials. 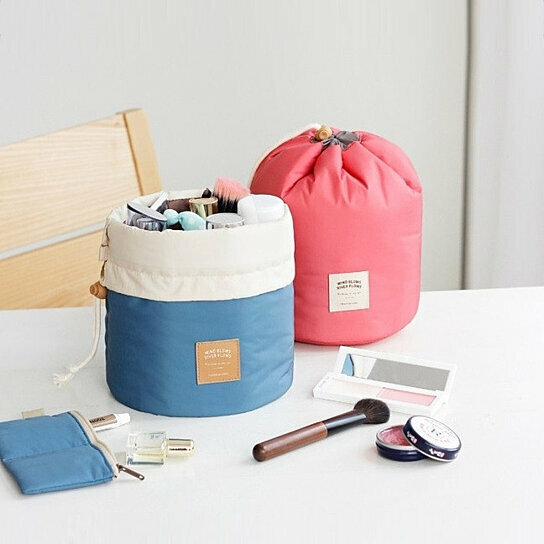 This clutter free washable pouch is spacious and practical. No more worrying if your liquid make and cleanser will spill or not. The cylindrical design with nets and bands on the interior hold several items with style and ease so that everything is visible and accessible any time you need it. Travel has never been so easy! Store anything from your Shampoo, Conditioner, Hairspray, Foundation, Blushes, and all your cosmetics and much more. All items will securely be held in place and ready for travel by closing the attached drawstrings. As a bonus, we have also included a mini pouch with a zipper closure for your jewelry, contact lenses, medicine, and all other important small items. This will save you time from scrambling inside your purse or your boring cosmetic bag for all small items. As a second bonus, We have included a PVC pouch for your glasses or brushes as it is essential for the brush heads to stay clean in order to avoid skin break outs. Get Organized and Get Going!